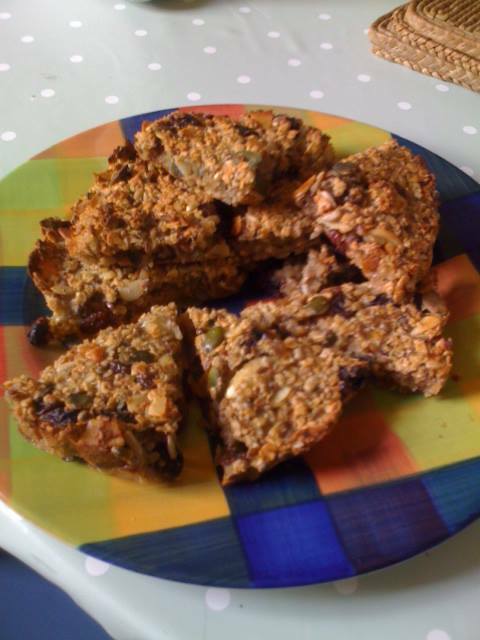 This is my favourite recipe for granola bars and the one I use all the time when I seem to have a surplus of oats and dried fruit. Perfect for a pre- or post-workout snack, combining fast-release carbohydrate from the honey and dried fruit and slow-release energy from the oats. The banana provides energy, B vitamins and potassium to aid muscle contraction and your choice of seeds/nuts can provide protein, fibre and omega 3. Only a small amount of butter and using honey instead of syrup makes these a much healthier snack than flapjack. Melt the butter and honey together in a pan then add to the dry ingredients and mix. Spoon into a lined baking tin and cook at 180C for 20 minutes or until golden brown. Isn’t that easy! This recipe is from little book called Easy Peasy, by Sophie Wright, so it really does what it says on the tin. My little alteration to the recipe is the banana, which is of course optional. The banana makes the bars a little more energy dense, which might be good on a long cycle or walk. The bars don’t keep as long with the banana in, but they won’t last long regardless! – they really are delicious. Posted in Recipes and tagged energy, granola, oats, workout.